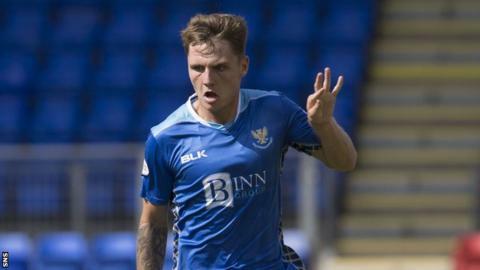 Scot Gemmill has defended his decision to omit St Johnstone's Jason Kerr from the Scotland Under-21 squad following criticism by Tommy Wright. Saints boss Wright said it "doesn't stack up" after "other players who are older" than Kerr, 21, were included. The defender is younger than John Souttar, who was originally named before being promoted to the senior squad, and his replacement David Bates. "We can't include them all," said Scotland Under-21s boss Gemmill. "But we're trying our best to help as many as we can. "I did call Jason when the squad was announced and explained that because we're getting close to when the age group changes, that we were starting to work towards including younger players. "I also explained we did want to have one older defender, who was due to be John Souttar. John was obviously then promoted to the full squad so the decision to bring David Bates in was made because we feel we have a responsibility to give the best young players in the country an opportunity. "I haven't spoken to Tommy Wright about it but he's just doing his job and I've got no problem with that." Kerr, who is five months younger than Souttar and four months younger than Bates, has been capped five times by Scotland-21s, including appearances at this summer's Toulon tournament. "We were delighted that we gave that opportunity to Jason," added Gemmill, whose side play European Championship qualifying opponents Andorra on Thursday and Netherlands next Tuesday. "He went to Toloun and has played for the 21s, so we feel we have helped Jason to develop as a young player. "Right now we feel we are in a position to give David that opportunity. He hasn't had that opportunity yet and is one of the best young players in the country. "Jason of course still has a part to play in the future but you have to cross every bridge when you come to it. Who knows who will be available the next time the squad is available."